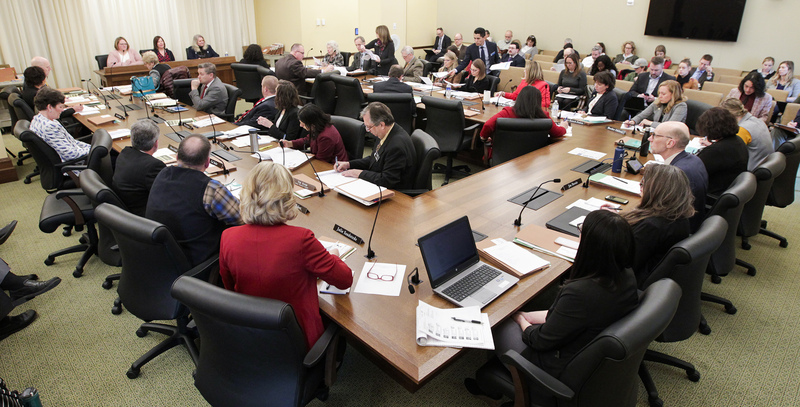 Children’s mental and behavioral health services are needed more now than possibly ever, according to several testifiers at a joint meeting Tuesday of the House Education Policy Committee and House Education Finance Division. The issue of kids’ mental health, in tandem with school safety, has dominated education policy and legislative discussions the last few sessions, particularly in the wake of the school shooting in Parkland, Fla., last February. Rep. Jim Davnie (DFL-Mpls), the division chair, said it’s important to start looking at the topic early this session, with input from teachers, social workers, counselors and others. Sue Abderholden, executive director for the National Alliance on Mental Illness Minnesota, presented an informational overview of children’s mental health and how the mental health system currently operates. She said mental health-related emergency department visits increased from 9,946 in 2007 to 19,368 visits in 2016. For children, ages 0-17, there was a 56 percent increase in emergency visits in Greater Minnesota and a 40 percent increase in the metro area. Additionally, half of all chronic mental illness begins by age 14, and by adulthood, 1 in 5 will be affected. The rise in mental health issues among children is also observed in the schools. Casey Cavanaugh, a first-grade teacher in the St. Paul School District, spoke of the challenges he faces in his classroom daily from children physically destroying property or endangering themselves or other students. Noting that Cavanaugh has been teaching for more than 25 years, Rep. Tony Jurgens (R-Cottage Grove) asked what he thought could be leading to the increase in mental health issues. The general consensus among the eight testifiers is that more resources and support staff are needed to help address the issue.